magnification 20 (top); 40 (bottom). PAS periodic acid–Schiff. Arthritis Rheum 2013 65, 1022-31. Enzastaurin (LY317615) purchased from Selleck. in Sle mice. A, Effect of enzastaurin on apoptosis of lupus B cells. (a and b) Isolated murine splenic B220+ B cells were pretreated with dasatinib (5 μM), a Lyn inhibitor; LY294002 (5 μM), a PI3K inhibitor; ibturinib (1 μM), a BTK inhibitor; enzastaurin (1 μM), a PKC β inhibitor; U0126 (3 μM), an ERK inhibitor; SP600126 (2 μM), a JNK inhibitor or SB20358 (1 μM), a p38 inhibitor for 1 h, followed by stimulation with anti-CD180 antibody (0.2 μg mL−1) or mouse IFN-α (1000 U mL−1) for 4 h. qPCR analysis of the expression of IFIT1 (a) and MX1 (b). Cell Mol Immunol, 2017, 14(2):192-202. Enzastaurin (LY317615) purchased from Selleck. PKC II contributes to the depolarization-induced enhancement of KCNQ currents. C, PKC inhibitor enzastaurin (2 μM) significantly reduced the depolarization (ND96-K)-induced increase in membrane PKC II levels. D, enzastaurin blocked the depolarization (0 mV)-induced increase of KCNQ2/Q3 current. **, p < 0.01 compared with the control. J Biol Chem 2011 286, 39760-7. Enzastaurin (LY317615) purchased from Selleck. 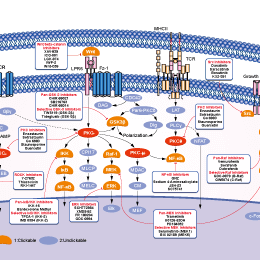 The inhibition of PKCβII, PKCα, PKCε, or PKCγ activity by enzastaurin is determined using a filter plate assay format measuring 33P incorporation into myelin basic protein substrate. Reactions are done in 100 μL reaction volumes in 96-well polystyrene plates with final conditions as follows: 90 mM HEPES (pH 7.5), 0.001% Triton X-100, 4% DMSO, 5 mM MgCl2, 100 μM CaCl2, 0.1 mg/mL phosphatidylserine, 5 μg/mL diacetyl glyerol, 30 μM ATP, 0.005 μCi/μL 33ATP, 0.25 mg/mL myelin basic protein, serial dilutions of enzastaurin (1-2,000 nM), and recombinant human PKCβII, PKCα, PKCε, or PKCγ enzymes (390, 169, 719, or 128 pM, respectively). Reactions are started by addition of the enzyme and incubated at room temperature for 60 minutes. They are then quenched with 10% H3PO4, transferred to multiscreen anionic phosphocellulose 96-well filter plates, incubated for 30 to 90 minutes, filtered and washed with 4 volumes of 0.5% H3PO4 on a vacuum manifold. Scintillation cocktail is added and plates are read on a Microbeta scintillation counter. IC50 values are determined by fitting a three-variable logistic equation to the 10-point dose-response data using ActivityBase 4.0. Induction of apoptosis by enzastaurin is measured by nucleosomal fragmentation and terminal deoxynucleotidyl transferase-mediated nick-end labeling (TUNEL) and staining in HCT116 and U87MG cell lines. Briefly, 5 × 103 cells are plated per well in 96-well plates (1% FBS-supplemented media conditions), incubated with or without Enzastaurin for 48 to 72 hours. The absorbance values are normalized to those from control-treated cells to derive a nucleosomal enrichment factor at all concentrations as per the manufacturer's protocol. The concentrations studied ranges from 0.1 to 10 μM. In situ TUNEL staining is assayed with the In situ Cell Death Detection, Fluorescein kit. Cells (7.5 ?104) are plated per well in 6-well plates and incubated 72 hours in 1% FBS-supplemented media ?Enzastaurin. Fluorescein-labeled DNA strand breaks are detected with the BD epics flow cytometer. Ten thousand, single-cell, FITC-staining events are collected for each test. Graff JR, et al. Cancer Res, 2005, 65(16), 7462-7469. Rovedo MA, et al. J Invest Dermatol, 2011, 131(7), 1442-1449. Podar K, et al. Blood, 2007, 109(4), 1669-1677. 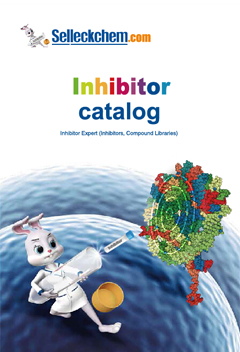 Sotrastaurin : Pan-PKC inhibitor, PKCα, Ki=0.95 nM; PKCβ, Ki=0.64 nM; PKCδ, Ki=2.1 nM; PKCε, Ki=3.2 nM; PKCη, Ki=1.8 nM; PKCθ, Ki=0.22 nM.